As a hand and upper extremity orthopedic surgeon, I specialize in surgeries of the hand, wrist, elbow and shoulder. Upper extremity surgeons must be well versed in different surgical techniques including trauma, sports related injuries, joint replacement, tendon repairs and transfers, nerve repair and reconstruction, arthroscopy, microsurgery, along with many others. The variety of procedures always keeps my job interesting! My patient care philosophy is to treat each patient how I would want someone to treat a member of my family. I never leave a patient room until I make sure my patient understands his or her condition and I have answered any and all questions. My job is to educate my patients on their conditions along with all of their treatment options, to help them decide which option is best for them. I enjoy working with and teaching the residents and fellows here at Ohio State. 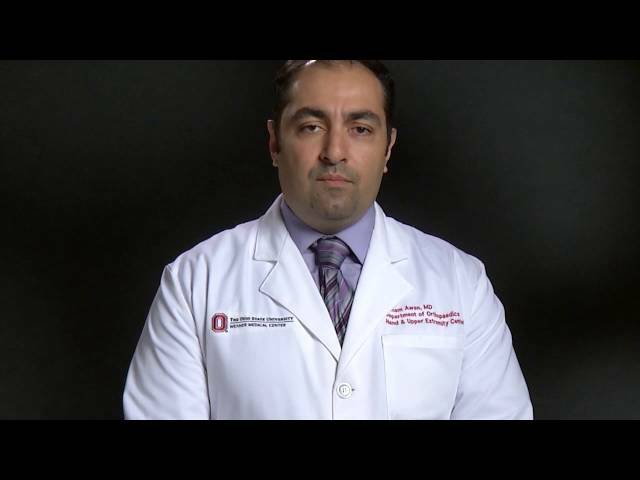 I also enjoy working at a tertiary referral center like Ohio State, where we see the most complex cases. Finally, I am part of an outstanding orthopedic department with tremendous camaraderie. When I’m not working, I like to spend my time relaxing with my family, traveling, attending Ohio State football games and watching movies. Have a problem very nice & good. Awesome, doc saw the injury and took care of surgery the following day. As of 12/20/2018, Dr. Awan has reported no relationships with companies or entities.